Just what is Shared Value? In December of 2010, just before the start of the World Economic Forum convention in Davos, professor Michael Porter released a much revered article in the Harvard Business Review, called Creating Shared Value, together with his partner in thought Mark Kramer. The article describes how a new form of capitalism is emerging where business looks at the possibilities it has in the core to leverage externalities for meeting social needs. The notion of Shared Value is contrary to CSR, which Porter considers as a peripheral activity to what firms actually do. The release of the Shared Value article was well timed for the Davos convention, and turned it into the talk of the town. But, with all the ruckus of promoting the Shared Value concept, the oblique nature of the article’s main contention -that Shared Value is a markedly distinguished concept and deserves meme-status as a new form of capitalism- remained unchallenged. The concept of Shared Value as described in the article needs more clarification. Because of the lack of clarity, the article actually unintentionally distorts the quest for achieving fundamental forms of shared value creation. Before I get to what I think would more clearly describe Shared Value creation and highlight the challenges to create it, let’s first have a look at Porter’s take. The problem with capitalism at the moment is that firms are to narrowly focused on creating monetary profit. Under this condition, firms focus primarily on their segment in the value chain, and don’t consider the implications of their operations in relation to wider social needs. Each enterprise active in the value chain is very much its’ own island, focussed on itself, and negative social and environmental externalities remain unaddressed. […] by reconceiving products and markets, redefining productivity in the value chain, and building supportive industry clusters at the company’s locations. 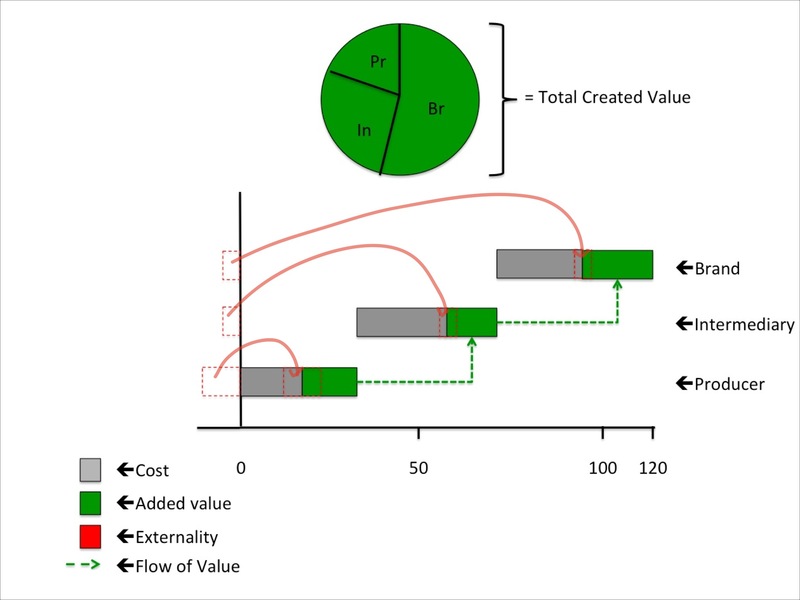 Regarding the first point, Porter ascribes the Shared Value label to a number of phenomena which would actually better be described as good old fashioned cost reduction, like reducing carbon emissions by increasing fuel efficiency, or slowing the rate of growth of landfills by reducing the amount of packaging. These are quite clearly not examples of Shared Value creation, but rather an internal process to the firm for increasing resource-use efficiency. Porter’s take on Shared Value creation. Each firm takes on to solve the negative externalities it produces. Some investment might be needed at the level of producers. This investment generally comes from public funding, but on rare occasions from other companies in the value chain. Value still flow upwards. So the central thesis of Shared Value is that we do not look at systems for redividing the pie, but rather for ways of making the pie larger so that even the most under dealt pie eaters, can capture a bigger piece. I think, however, that this thesis won’t cut that pie, and here’s why. There is an inherent flaw in Porter’s thesis, and I’m lucky to demonstrate it, as Porter makes his case, by looking through the lens of the agricultural value chain. 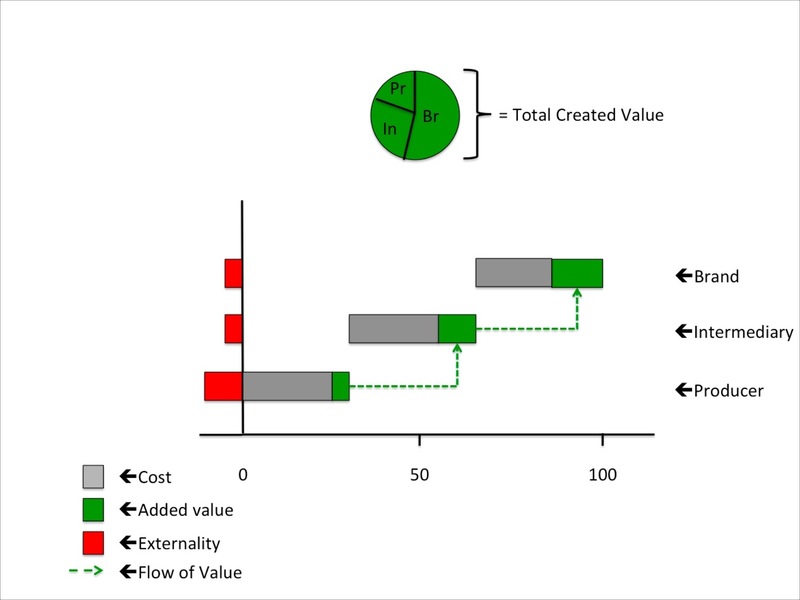 Farmers are generally at the closing end of the value distribution and capturing process in value chains. They create a lot of the value, but due to their position in the value chain system, they always get dealt the piece of the pie that’s left after everyone else has taken their share. Companies situated more downstream in the value chain have more opportunity for capturing value in the market, and this suppresses farmers’ value capturing opportunities, putting them in a structurally precarious position. In effect, if the pie is enlarged under these conditions, chances are very likely that the relative share of groups like farmers will decline as a consequence, not increase. I would argue that unless new forms of value distribution are developed, which can patch this precarious position due to lack of value capturing opportunity, farmers will always face the issue of not being adequately able to upgrade their production standards to more sustainable use of natural resources. Grave externalities will remain. Increasing productivity and yields might work in the short run, but in the long run this will not suffice. I can vouch for this with the case of agriculture in my home country, The Netherlands. Although we have one of the world’s most efficient and productive agricultural sectors, farmers are struggling to invest in adapting their businesses to changing consumer and societal demands, and even to make a decent living, because of a lack of value capturing opportunities. Finding solutions is thus not all about the yield and quality. It’s about what kind of business models we can design in the value chain that will adequately distribute value according to the performance that is actually delivered by the producer. What needs to change about the way capitalism functions is the opportunities parties have to capture part of the total value created in their value chains. To provide this opportunity, we need to develop new value distribution mechanisms, which are able to equitably distribute value according to performance delivered by value chain members, regardless of whether this is product quality performance or social/environmental performance. These mechanisms could be for instance tradable environmental services, or producer participation in brand value creation with lead firms. There are all kinds of innovations we can experiment with to distribute this value. If we succeed then the pie will most likely be divided differently, between parties in the value chain who have actually contributed to shared value creation. This will be a new form of capitalism, which breaks through the old issue of islands in the value chain, and connects communities that distribute value based on respective contribution, rather than ability to capture it. New capitalism is not about the size of the pie, it’s about fundamental Shared Value. 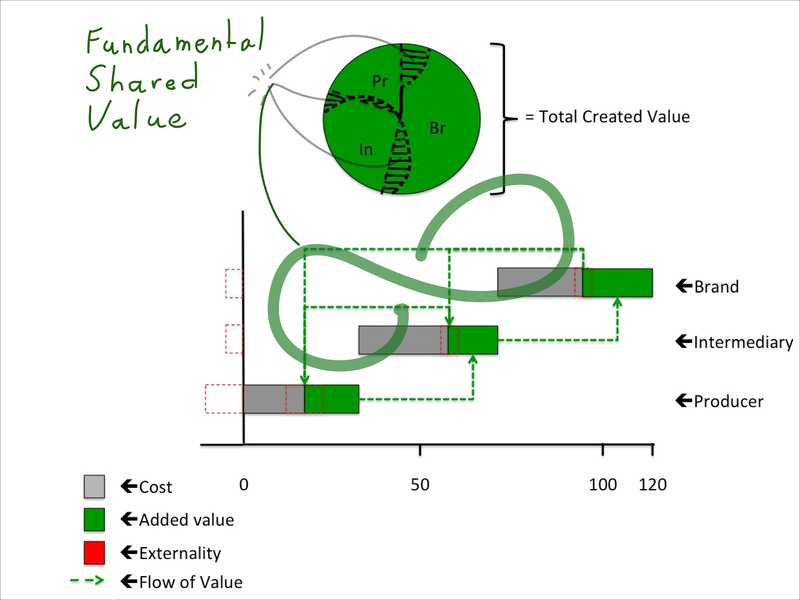 In the case of fundamental Shared Value, value flows differently: both upwards and downwards. Value is shared by parties who have contributed to creating it. This is the only way to sustainably deal with covering the costs of dealing with negative externalities in the value chain, regardless of whether the pie is large or small. These choices will need to be made on the basis of fundamental understanding of the value chain community, and the business ecosystem in which it is embedded. Only this understanding will provide the new fabric with which more robust and sustainable form of capitalism can be created. An inspiring example of this integrated thinking on value chain design is provided in the following presentation of designer Yves Béhar. In this presentation, Yves talks about the journeys he undertakes in designing new radically sustainable products (like the famous Cradle-to-Cradle Herman Miller chair). The presentation clearly shows that the design challenge we are facing to reinvent the capitalism in meeting societies needs, lies in finding new ways of value creation, capturing, AND distribution. Enjoy the process! – Porter’s Shared Value creation is a thin rework of his previous more fundamental work on the relation between sustainability and core business. – In order to find distributive mechanisms, we need to delve deep into the operations of the value chain. Design thinking approaches are needed to integrate product design with impact on social (business) system design.